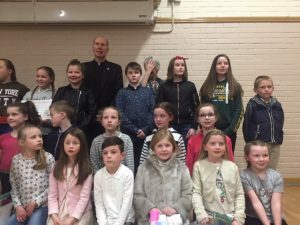 Congratulations to Ava Miller (2nd Class), Penny Jacob (2nd Class) and Rachael Jacob (6th Class) who have been awarded prizes for the poems they wrote for ‘The Creative Spirit’ competition . This competition was in conjunction with the Ferns Diocesan Pastoral Council and the Christian Media Trust. The girls’ poems will have been recorded and will air on a programme with Christian Media Trust in due course. Well done girls! !